When he was around 11 Boris Perrott, the president of the Philharmonic Society of Guitarists, heard him and, duly impressed, offered to teach him. The boy was honored, but soon found that he disliked the outmoded technique that Perrot insisted on. This according to “Julian Bream at 60: An interview” by Gareth Walters (Guitar review 96 [winter 1994] pp. 2–15). Today is Julian Bream’s 80th birthday! 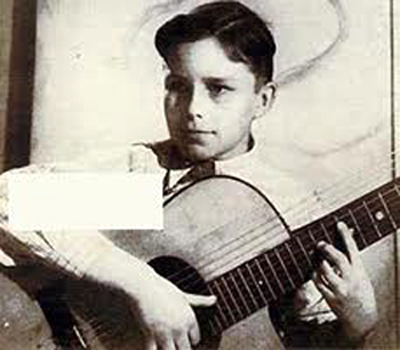 Above, Bream with a harp guitar at the age of 14; below, his arrangement of Danza del molinero from Manuel de Falla’s El sombrero de tres picos.